Kim is reportedly keeping her ring. Kim Kardashian's marriage to NBA star Kris Humphries may be over – but she's apparently keeping her 20-carat engagement ring. 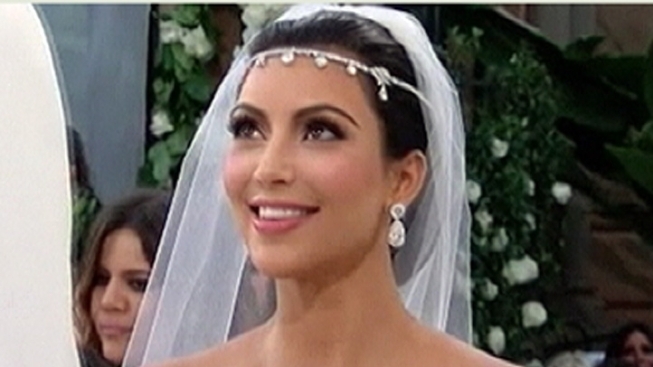 "She is going to keep the ring," People's Assistant Editor Jen Garcia, a guest at Kim's August nuptials, told Access Hollywood on Wednesday, quoting sources that spoke to the mag. Since Kardashian was the one who broke it off, etiquette dictates that she should give it back, but according to Garcia, the reality star is attached to the rock. "It's something that's debatable, obviously, with etiquette, but it was a gift to her, it was a present and it's something very sentimental to her," Garcia told Access Hollywood. According to estimates, the ring is actually worth about $2 million, which is nearly $1 million shy of Humphries' reported 2011 $3.2 million salary with the New Jersey Nets. Humphries yearly salary, however, is dwarfed by his estranged wife's sizable paycheck. Forbes has reported she made about $12 million last year. And with an NBA lockout still in effect, Humphries isn't earning any money from playing basketball. PLAY IT NOW: Did Kim Kardashian Recruit Kris Humphries To Play Her Reality TV Husband?